Denmark was the only occupied country that actively resisted the Nazi regime's attempts to deport its Jewish citizens. On September 28, 1943, Georg Ferdinand Duckwitz, a German diplomat, secretly informed the Danish resistance that the Nazis were planning to deport the Danish Jews. 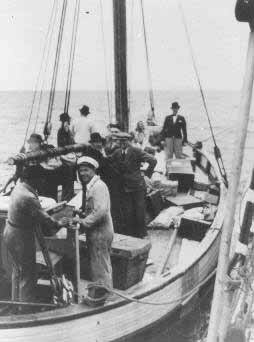 The Danes responded quickly, organizing a nationwide effort to smuggle the Jews by sea to neutral Sweden. Warned of the German plans, Jews began to leave Copenhagen, where most of the 8,000 Jews in Denmark lived, and other cities, by train, car, and on foot. With the help of the Danish people, they found hiding places in homes, hospitals, and churches. Within a two-week period fishermen helped ferry 7,220 Danish Jews and 680 non-Jewish family members to safety across the narrow body of water separating Denmark from Sweden. The clandestine rescue of Danish Jews was undertaken at great personal risk. 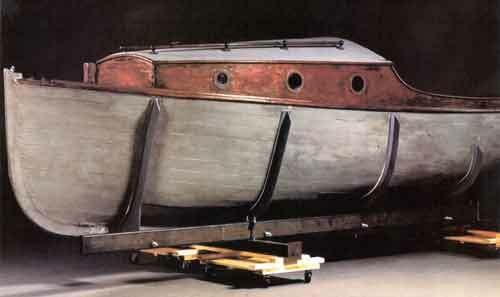 The boat pictured below and several others like it were used by one of the earliest rescue operations organized by a group of Danes code-named the “Helsingor Sewing Club.” The escape route they provided, named the “Kiaer Line” after Erling Kiaer, founder of the “Helsingor Sewing Club,” enabled several hundred Jews to escape across a narrow strait to the Swedish coast. On each trip, the boat carried 12-14 Jewish refugees. Kiaer himself was betrayed and arrested in May 1944. 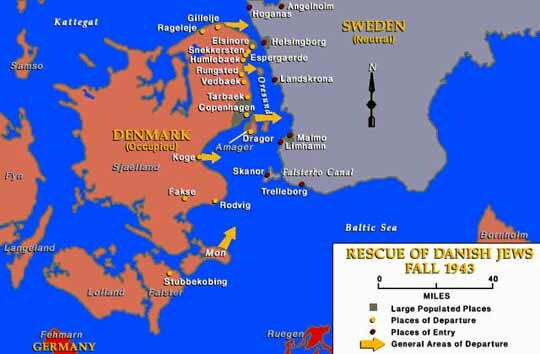 The Danish rescue effort was unique because it was nationwide. It was not completely successful, however. Almost 500 Danish Jews were deported to the Theresienstadt (Terezin) ghetto in Czechoslovakia. Yet even of these Jews, all but 51 survived the Holocaust, largely because Danish officials pressured the Germans with their concerns for the well-being of those who had been deported. The Danes proved that widespread support for Jews and resistance to Nazi policies could save lives.